Because we believe that food is such a big part of a luxury charter, Princess Charter loves recommending the best places to take your taste buds on an exciting adventure. So, when you are not tasting delights on board with your private chef, we know some great eateries ashore to explore. 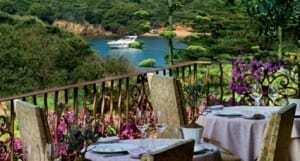 Perched on the cliffside within the rustic village of Eze, La Chèvre d’Or offers an exceptional setting for gourmet charterers to enjoy its delicious two Michelin-starred regional cuisine. At the terrace, the view of the azure sea is absolutely stunning and was made famous from scenes in Hitchcock’s movies. Indulge with the Red mullet, marinated with truffle with olive oil candied pepper. Refinement of flavours and a photogenic spot, characterise this three Michelin star restaurant. Guests can dine by the water admiring sublime views whilst savouring the finest dishes made from ingredients that capture the essence of the French Riviera. As another indication of its quality, Chef Arnaud Donckele has been awarded the Best Chef of 2019 by peers at the Chefs World Summit. 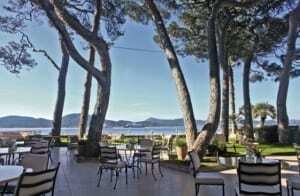 La Vague d’Or is one of the top restaurants of the French Riviera and we couldn’t recommend it more. Indulge with the excitement of the unknown – the secret menu is not disclosed. Once inside, you will be greeted by a gorgeous courtyard with a profusion of plants and vegetation. Don’t let the residential surroundings of La Villa Archange fool you. Also known as a paradise for foodie, the food here is one of the most creative and imaginative in contemporary French cuisine. All served in a Belle Epoque style. Indulge with the Sisteron’s lamb, candied black olives with juice. Hidden from the crowd on the amazing Porquerolles island, Le Mas du Langoustier is definitely a must, if your charter itinerary stops on the island. The décor and atmosphere of this rural island paradise will simply take you straight into a scene from F Scott Fitzgerald’s Tender is the Night. The one Michelin-starred food is not at all pretentious and meticulously highlights true Mediterranean flavours. 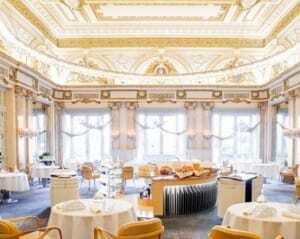 Opening 22 years ago, Louis XV is Alain Ducasse’s flagship restaurant. As a three Michelin-starred restaurant, the food is heavenly, light and delicate, influenced by local Mediterranean cuisine. The remarkable dining experience feels like dining at Chateau de Versailles. Indulge with the Blue lobster, cime di rapa, baby turnips and pink peppers. Inside the 1960’s Grand Hotel, on the famous Croisette Boulevard, Le Park 45 couldn’t have a better location. It is the picture-perfect place to stop over for lunch after a morning’s shopping. Indulge yourself in the delicious specialities with your spot on the sunny terrace overlooking the Croisette. Indulge with the hazelnut eclair and the restaurant’s own ice-cream sprinkled with chocolate chips.